An important documentary about the gay civil rights movement in Louisiana. 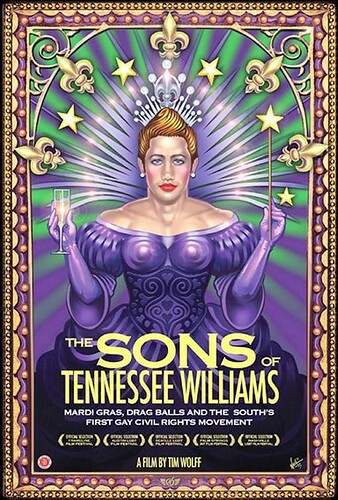 The Sons of Tennesee Williams is a documentary about the gay Mardi Gras krewes out of Louisiana. This film not only shows the fun and wild side of gay Mardi Gras but takes a deeper look at the civil rights movement at the heart of the gay krewes. Through present-day interviews and archival footage, The Sons of Tennessee Williams tells the story of the drag movement and the fight for civil rights that predated most other homosexual liberation movments by almost 10 years. For many years in Louisiana it was against the law to be openly homosexual and any homosexual activity could be punished by imprisionment. Mardi Gras was the one day of the year that it was legal for homosexuals to mingle in public and dress in drag. However, men had to be out of drag by sundown and men always had to be wearing at least one piece of masculine clothing. People could not even dress in drag on Halloween. The rest of the year, gay men were subject to being "rolled" (beaten up) or jailed if they were known to be gay. In the midst of trying to deal with the fear of being publicly outed through police raids and their names being published in the local paper, groups of men began forming their own exclusive krewes where they would be safe and could express their true identities. These krewes began holding their own Mardi Gras drag balls that are now some of the most wildly popular of the season. The film not only explores the beginning of gay civil rights in Louisiana but it also shows how the AIDS epidemic almost wiped out many krewes and the devastating toll Hurricane Katirna took on their tradition as well. The footage of these men from the original krewes is heartwarming. Their words and stories intermingled with photos and footage from the 1950s helps tell the tale of this early gay movement. Their stories are so important in the continued fight that gays and lesbians are still having to fight in this country along with their straight allies to obtain truly equal rights. The costume photos in the special features are great. It's nice to really get a chance to see these spectacular creations. And although I enjoyed the bonus footage and deleted scenes, they did not leave me with the feeling that the documentary was lesser for leaving them out. This film does have issues in regards to editing. Some of the interviews jump quite a bit and that proved distracting at times. However, that issues with editing were not enough to ruin the overall enjoyment of this documentary. The Sons of Tennessee Williams is important for people of all backgrounds and lifestyles. It serves as a reminder of the continued fight that gay and lesbian Americans are still facing in our country. It can also educate those people who don't know about the history of violence in their fight for equal rights. But don't forget that at the heart of this film is the spirit of fun, fabulous glamour that these men have brought to the Mardi Gras tradition.